Armed violence has powerful, lasting impacts, inflicting severe injuries and impairments and leaving behind broken families, fearful communities and societies in which violence is the norm. It is a daily fear and fact of life for millions of people, particularly those in low income countries and in the marginalized urban zones of more developed countries. 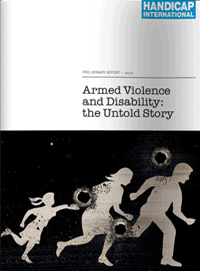 SPADO has carried out a research, in partnership with Handicap International Belgium, on armed violence and disability. The study focused on the historical context of armed violence, actors, understanding the existing legal frameworks, victims assistance and providing relevant recommendations to the government and civil society organizations. In that regard interviews with the survivors of the armed violence and key informant interviews with an array of people coming from different backgrounds were conducted. Secondary data was collected from different police stations and hospitals. The research study was published as a case study along with three other conflict affected countries which are Haiti, Columbia and Uganda.